Review by AllTheBestFights.com: 2017-10-21, good fight between Donald Cerrone and Darren Till: it gets three stars (UFC Performance of the Night). The black belt in Brazilian jiu-jitsu and gaidojutsu Donald Cerrone entered this fight with a pro mma record of 32-9-0 (75% finishing rate) and he is ranked as the No.9 welterweight in the world (currently the #1 in this division is Tyron Woodley) but ‘Cowboy’ comes off two consecutive losses, against Jorge Masvidal (=Cerrone vs Masvidal) and Robbie Lawler (=Lawler vs Cerrone). His opponent, the undefeated Darren Till, has a record of 15-0-1 (73% finishing rate) and he entered as the No.55 in the same weight class. The only man who stopped him in a draw was Nicolas Dalby in 2015 (=Dalby vs Till), after this fight he ha won over Jessin Ayari and Bojan Velickovic. Cerrone vs Till is the main event of UFC Fight Night 118. Watch the video and rate this fight! Review by AllTheBestFights.com: 2017-10-21, some good exchanges between Karolina Kowalkiewicz and Jodie Esquibel but it is not enough to get three stars: it gets two. The former Ksw Flw champion Karolina Kowalkiewicz entered this fight with a mma record of 10-2-0 (30% finishing rate) and she is ranked as the No.9 women’s strawweight in the world but she comes off two consecutive defeats, against Joanna Jędrzejczyk (=Jedrzejczyk vs Kowalkiewicz) and Claudia Gadelha (=Gadelha vs Kowalkiewicz). Her opponent, Jodie Esquibel, has an official record of 6-2-0 (17% ko/tko victory rate – she has never won via submission) and she entered as the No.23 in the same weight class. She lost to Alexa Grasso in 2016 but she comes back to win in 2017 against DeAnna Bennett. 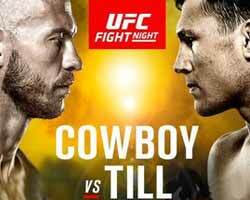 Kowalkiewicz vs Esquibel is on the undercard of Donald Cerrone vs Darren Till – UFC Fight Night 118. Watch the video and rate this fight!